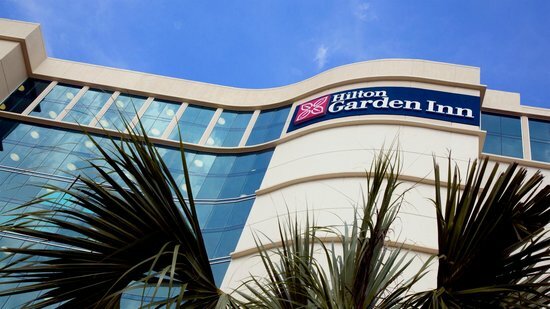 The Hilton Garden Inn opened in Spring 2014, offering 167 guestrooms and suites, all with ocean views, private balconies, and the things that make traveling with kids a bit easier: microwaves and mini-fridges. It’s also located just a few blocks from Neptune Park, a hub for family-friendly events. The hotel’s casually elegant lobby is decorated in travertine, fabrics the color of caramel and sand, and beautiful oil-rubbed bronze lanterns that give the place a beach-y inn (and not your average chain hotel) feel. 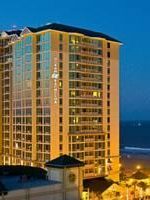 The Hilton Garden Inn Oceanfront will quickly become your family’s favorite hotel in the Virginia Beach area. The nearby beach playground and the hotel’s third floor sundeck are ideal places to strike that tricky balance between relaxing with a morning beverage and entertaining kids. In addition, the property’s unique pool is a hit with older kids who love climbing over the tiled wall that separates the indoor/outdoor pool sections and swimming beneath water sprays. 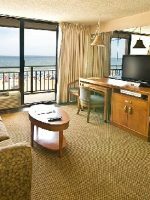 The hotel's 167 guestrooms (24 of which are suites) each have an oceanfront balcony and a coastal, casual decor with furnishings and fabrics in caramel browns and sandy beiges, plus framed photographs of beach walks, dunes and the shore. 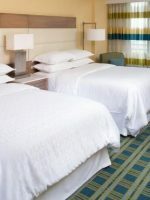 Each room and suite also has a microwave, Keurig coffee maker, mini-fridge, comfortable Serta bed, desk and ergonomic desk chair, small safe (large enough for iPads, but not for mid-to-large laptops), 42-inch HD TV's, BluRay disc player, complimentary Wi-Fi, alarm clock with an MP3 jack, and at least one comfortable club chair with an ottoman. Movies can be rented through the TV or you can bring your own for the BluRay player. Bathrooms have a shower with a curved rod for a more spacious feel, Neutrogena shampoo, conditioner and body lotion, make-up wipes, and a full-size hair dryer. Pack 'N Play style cribs are available gratis. Rollaway beds are available for $10 and limited to one per room or suite. Washers and dryers are available on the third floor (payable with coin or credit card). Connecting and ADA compliant units are available. 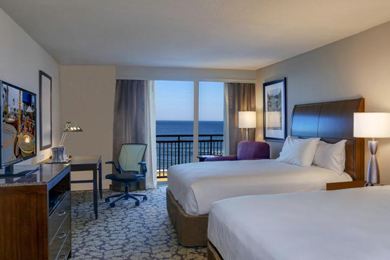 Rooms and suites on all floors have oceanfront balconies, however, third floor balconies front the large sun deck that runs the length of the building and is filled with cushioned loungers and semi-circular outdoor sofas. The 331-square-foot standard rooms have all of the above and include one king, or two queen, comfortable Serta beds and pillows. One-bedroom suites feature everything mentioned above, and have either two queen beds or one king in the bedroom, and a sofa bed in the living room, plus a wet bar. Suite sizes differ considerably. 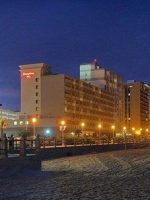 North end suites are 712 square feet and have a full wet-bar with a sink, a larger bathroom, plus larger windows and a bay-shaped balcony that affords a wider view of beach and boardwalk. The 444-square-foot south end suites still have the mini-fridge and microwave, but no sink or added counter space. North end suites are roughly $20 to $30 more per night. This time I took my children with me, and we had a blast. Everything from using a digital key, the great swimming pool, room service....you name it it was great. Staff is always friendly and eager to help meet your needs. This place is always busy. Too busy. The hotel is dated. The food is mediocre. The staff is very pleasant and helpful. That said, it's too expensive for what you get. I always use points to make it more palatable. The concierge desk can help you rent needed paraphernalia through Sunrise Beach Services. Lounge chairs are $12; padded loungers are $18; folding chairs are $12; umbrellas are $15; cabanas are $25; and boogie boards or rafts are $5 each. All prices are per day. If you're going to need boards and rafts for multiple days, consider buying them at one of the nearby stores. You can rent these amenities for four days and a fifth day free, too. In addition, the Hilton Garden Inn sets up a children's sand play area on the beach in front of the hotel daily, with free buckets, shovels, kid's chairs and beach umbrellas. The indoor/outdoor, heated pool is separated by a glass garage style door that is open from Memorial Day through October. Water flows across a tiled wall between the two sides and you can climb over the wall (what most kids love to do), or hop out and jump back in on the other side. The indoor side has a rain shower that sprays water from the ceiling. The outdoor side features a section that is just 8 inches deep, which is a big hit with kids and parents for its warm shallow water and curved floating chairs. The pool, which is open from 9 a.m. to 10 p.m. daily, has a 3-foot shallow end. There is no lifeguard and parents must be present for kids to swim. 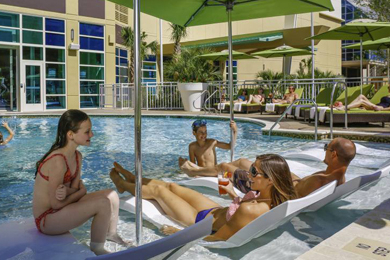 The hotel's third floor sundeck is an ideal place to relax with kids, toys, a board game (bring your own), or books above the boardwalk fray. This beautiful outdoor space spans the front of the hotel and is furnished with cushioned lounge chairs, shade umbrellas, semi-circle sofas full of pillows, and oversized potted palms and flowers. There are plenty of seasonal activities just outside the door along the boardwalk, from surf competitions and beach volleyball, to concerts, fireworks, and a holiday lights display that puts a coastal twist on winter lights. 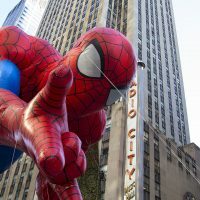 Check the hotel's website for the latest calendar of events, plus information on the free mystery-themed "Family Great Adventure Series," (held on several summer nights), where families dress up as characters, participate in contests that require brain and brawn, and end with a family-friendly movie shown on a giant inflatable screen on the beach. The restaurant's slogan, "Great Minds Eat and Drink Alike" (etched on the entrance wall) is fitting for this pleasant onsite restaurant that offers a pub-style menu with a coastal twist. Menu items include buffalo shrimp, soups and salads, seafood specialties, 12 different kinds of burgers, plus a small selection of chicken and steak dishes. Prices range from $7 to $28. Specialties include BBQ Baby Back Ribs, a Black Fin Crab Burger, house-made chili and the Catch 31 Oysters Rockefeller. Don't miss their Nacho Tower, made with mesquite chicken, black beans and roasted sweet corn. It's more elaborate and delicious than your average nachos. Beer aficionados will appreciate the four menu pages devoted to beer. The "Beers Q & A" offers details on everything from what makes a Belgian ale different from a blonde one and what defines an Imperial Stout. Better still, you can sample Lager Heads' craft beers with beer flight choices that include four pales ales, brown ales, or seasonal brews. Rest assured, though, it's not all about beer at Lager Heads. During our stay, there were many families throughout the restaurant's high top tables, booths, and outdoors on the comfortably furnished patio, listening to live acoustic music and watching other families bike by in surreys. 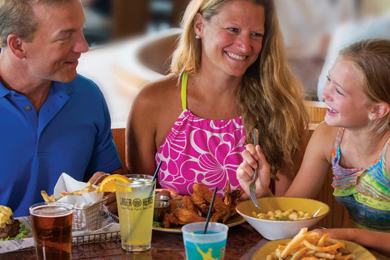 Lager Heads is open for lunch and dinner, from 11 a.m. to 2 a.m.
High chairs, crayons, and a colorable Lager Heads kids' menu with ocean trivia, true/false questions and seashell-themed math problems, are available. Kid-friendly fare includes a cheeseburger or chicken tenders with fries for $7, and fish and chips or macaroni and cheese for $5. A condensed version of Lager Heads menu is available (same pricing) via in-room dining from 5 to 9 p.m. Located off the lobby, the Garden Grille & Bar offers a breakfast buffet that includes cooked-to-order eggs, omelets, waffles, pancakes and French toast. Buffet items include whole and fresh-cut fruits, oatmeal, a cereal selection, yogurt, bacon, home fries and pastries. Wooden high chairs are available, however, if you have a baby or toddler sleeping happily in the stroller, there's ample room to wheel the stroller up to your table and leave them be. The Grill is open everyday from 6 to 11 a.m. for breakfast and is $12.95 for ages 12 and up and $6.95 kids under 12. Complimentary self-service Starbucks coffee and tea is available in the lobby each morning from 6 to 11 a.m. In the afternoon, the coffee service is swapped out for fancy dispensers filled with water and orange or lemon slices. Located in the lobby, Pavilion Pantry is the place to pick up things for your room's microwave and mini-fridge, like mac and cheese, pasta, chicken and vegetable dishes, mini pizzas, yogurts and fruit cups, plus ice-cream snacks and toiletry items, too. Services are available through the outside agency Nanny Poppinz, 24 hours a day, 365 days per year. 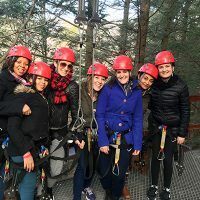 The agency caters to families looking for full and part-time nannies, however, it also offers a "temp" nanny service for traveling families and require a four-hour minimum for about $40. The hotel's fitness center is open 24 hours, and offer cardio equipment and weights. Complimentary parking is available in a garage across the street or guests can use the $15 per night, valet service. June through September is the hotel's busiest time. The winter months are typically the slowest and the best time for bargains. Special packages are offered year-round and include breakfast, surf lessons, and more. 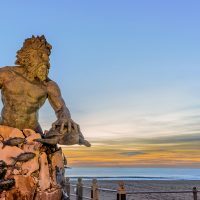 Virginia Beach temperatures are relatively warm year-round, and humid in the summer with highs in the 80's and 90's. If you're not yet wed to school calendars, September and October can be ideal months to visit. The crowds are gone, the water is still warm, and highs are in the 60- to 80-degree range. Winter highs average between 50 and 60 degrees and make for an economical time to get away and enjoy the holiday-themed light displays and events. Norfolk International Airport (ORF) is 18.2 miles from the hotel. A cab costs roughly $30 each way. Rental cars are available at the airport for those looking to drive themselves. 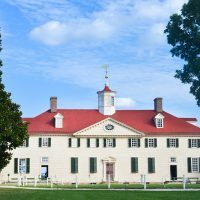 The Newport News Williamsburg International Airport is about an hour from the hotel. Both airports service large carriers. Traversing the boardwalk and neighboring streets is easy by foot, bike, or the Hampton Roads Transit (HRT) "VB Wave," which you can take from the beach's North End to South Rudee Inlet, and many places in between, including the Virginia Aquarium & Marine Science Center, or First Landing State Park. Head to Lager Heads outdoor patio and grab one of the tables with cushy chairs. 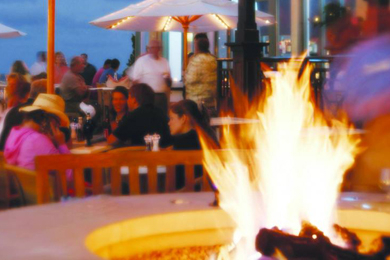 From there, sample a beer flight, listen to live acoustic music on summer nights, then take a post-dinner stroll on the beach.